Theyre selling the buildings at Kennicott. You need to buy one. It was 1976 and our friends Eric and Joan, who had just finished building a cabin in McCarthy, had come to Anchorage so that they, too, could buy buildings in Kennicott. It was the height of the pipeline boom, and anything seemed possible  even buying a house, sight unseen, that was 320 miles away. 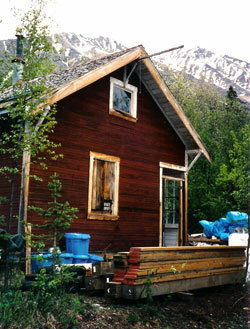 My husband, Jack, and I had been to McCarthy, but had never made the extra 5-mile trip to the ghost town of Kennicott. 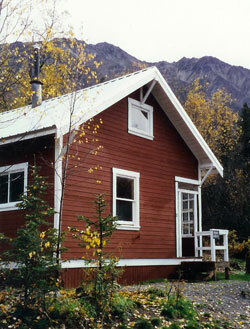 Still, we loved the magnificent scenery of the Wrangell Mountains and we trusted our friends when they assured us that the house was structurally sound. We bought the house that week. The house, built in 1918, is one of seven on Silk Stocking Row on the hill above town. These houses had originally been the homes of managers for Kennecott Copper Company when the mines were in the richest copper-producing area in the world. We made our first trip to see our new purchase in September, 1976, and were overwhelmed by the beauty of the area with 16,390 foot Mt. Blackburn rising above the Kennicott Glacier and the aspen trees glowing gold in the fall sun. We were also taken with the charm of the town and the incredible craftsmanship that had gone into building it. Although there was a bridge across the Kennicott River when we bought our house, it washed out soon after when a hidden lake under the glacier let loose with destructive force. Now we owned a house on the other side of a raging river  and had no easy way to get there! By 1983, the residents of McCarthy had constructed a tram. Getting to our house was quite an adventure. From Chitina, we drove 60 miles down a one-lane dirt road that had once been the bed of the Copper River and Northwestern Railroad. 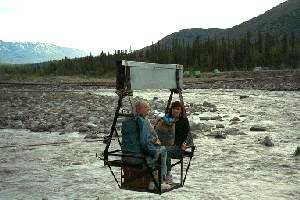 Then wed load supplies into the tram, cross the river, unload, and walk the 5 miles to Kennicott and our house. In 1996 the State built a footbridge across the river and we managed to get a vehicle on the other side, making the trip a bit less adventuresome but certainly much easier. 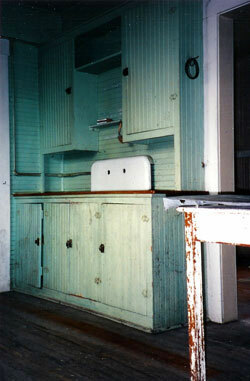 By 1994 it became clear that the house needed work. The quality of the original construction was incredible, but 75 years of Alaskan winters had taken their toll, and the house needed a new roof, a new foundation, and lots of paint. 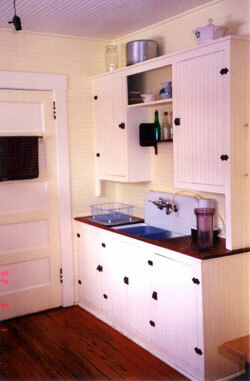 My husband had died in 1993, so major renovation seemed an overwhelming task for me. Fortunately, my Kennicott neighbors and longtime friends were also renovating their house. Together, we made endless lists of needed building materials and planned the logistics of how to get the materials across the river and up to our houses. We found friends with construction skills who were willing to spend weeks each summer crawling in the dirt under the house to put in new support timbers; working in the rain to put on a new roof; and spending seemingly interminable days scraping old paint from the walls and putting on new paint. The work was hard, but the camaraderie was great, and two summers of renovation work strengthened old friendships and forged new ones. All the hard work was worth it  the house is beautiful! After all these years, theres the bustle of summer daily activity in Seventeen Silk Stocking Row again! Return to Seventeen Silk Stocking Row home page.